All pictures on the site are works undertaken by Hayes and Hardy. Design, create and install a new shower room on the third floor of a Victorian Town House. Groehe shower, Roca sink and toilet. 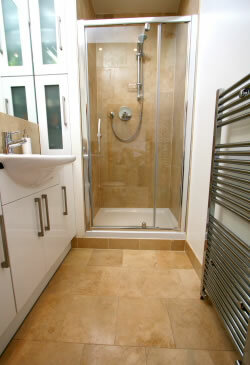 Travertine natural stone tiled floor, walls, splashback and skirting. Fitted white gloss floor and base units. Recessed halogen lights and mirror light. Chrome towel rail, remote controlled velux window.